Moto meter prop for the 1928-31 Model A Ford when fitted with a motometer. All parts are machined from aluminium except propeller which is black plastic. Mounts between moto meter and locking cap. Spins while you drive! Made in USA. Plain rim moto meter with locking cap for the 1928-29 Model A Ford. This is the screw thread style. Plain rim moto meter complete with locking cap for the 1930-31 Model A. This is the bayonet fitting type. 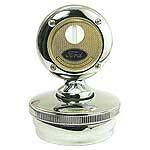 Wreath rim moto meter with locking cap for the 1928-29 Model A Ford. This is the screw thread style. Wreath rim moto meter complete with locking cap for the 1930-31 Model A. This is the bayonet fitting type. Locking Radiator cap for use with a motometer. This is the cap only without the motometer. This 1928-29 cap is threaded and locks in place with allen screws so it can't be removed without tools. This 1930-31 type has a bayonet fitting and locks in place with allen screws so it can't be removed without tools. 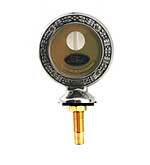 Moto meter with wreath Rim in chrome to fit your existing locking cap. 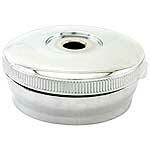 Moto meter with plain Rim in chrome to fit your existing locking cap. Moto meter wings 1928-31. All brass chrome plated wings for mounting with motor meter. These mount bewteen the bottom of the moto meter and locking cap. This is the special gasket that goes between the locking cap base and the flip up lid. Made in USA. Flying quail for the 1928-29 Model A Ford with the screw on radiator top. A beautiful reproduction of the famous original Ford accessory. Complete with the locking cap. 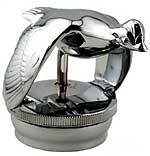 Flying quail for the 1930-31 Model A Ford with the bayonet type radiator top. This is a beautiful reproduction of the famous original Ford accessory. Complete with the locking cap. Thermo' quail for the 1928-29 Model A Ford. Now you can enjoy the quail cap and a moto meter at the same time. The thermo quail has a thermometer mounted in the center. Hardly shows from the front, but easy to read from the drivers seat. Made in USA. Thermo' quail for the 1930-31 Model A Ford. Now you can enjoy the quail cap and a moto meter at the same time. The thermo quail has a thermometer mounted in the center. Hardly shows from the front, but easy to read from the drivers seat. Made in USA. Replacement thermometer for the thermo quail. Why buy a new thermo quail just because the thermometer doesn't work. You can purchase this unit and replace it in your old thermo quail. Made in USA. Note: These thermometers do not fit the standard motometer. Moto meter repair kit 1928-31. This is the lens, gasket and screws for rebuilding the model A moto meter. Made in USA. Note: No thermometers ave available. Ford face plates 1909-31. A pair of back and front Ford plates for the Junior size moto meter which is the size that we sell. Set of 2. Made in USA. Boyce face plates 1909-31. A pair of back and front Boyce plates for the Junior size moto meter which is the one that we sell. If you are using one of our moto meters in another make of vehicle, you can remove the Ford plates and replace them with these. Set of 2. Made in USA. Locking cap repair kit for the 1930-31 Model A Ford. Repair kit works on any 30-1 locking cap or quail. Includes gasket for between cap and radiator & for between upper and lower parts of the locking cap, stainless screws and brass tabs. Moto meter gasket 1909-31. This gasket goes between the base of the moto meter and the locking cap. Made in USA. Moto meter nut 1909-31. 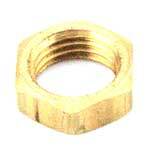 Thin brass jam nut that holds the moto meter on the cap. Made in USA.